The Reverend Laura Mariko Cheifetz serves as the Executive Director of Church & Public Relations at the Presbyterian Publishing Corporation. She received her M.Div. 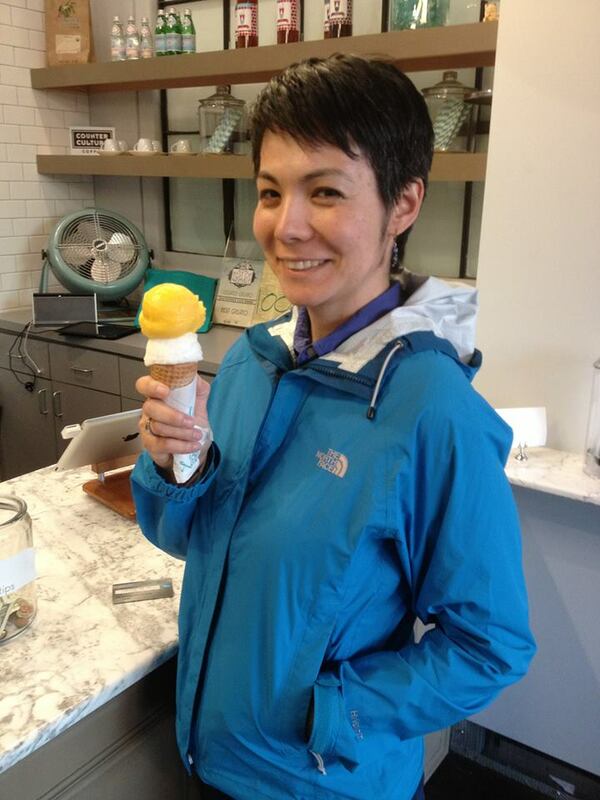 from McCormick Theological Seminary in Chicago, and her MBA from North Park University in Chicago. Laura has a chapter in the book “Streams Running Uphill.” She is an ordained Teaching Elder in the Presbyterian Church (USA). She enjoys spending time with friends over food, exploring whichever region in which she happens to live, and still believes The Wire is the greatest television show in history. Whenever people who are not Asian American tell me I have lots of privilege, I would like that credit to go into my microaggression account. Thanks to my reality as a biracial Asian American woman in the U.S., the weight of microaggressions can sometimes overpower my usually healthy sense of self and place in the world, and I head into what I call my spiral of despair. I have to go read Asian American or Latin@ or Native American feminists to pull myself out of the emotional quagmire. I have to remind myself that I’m not alone. But mostly I’m mad because I think what she has done is given more fodder to the model minority myth, driving a wedge between groups who could gain more by working together, but instead play right into the divide and conquer tactics practiced by the system of power and privilege we know as U.S. racism. This latest book just expands and makes more specific the number of groups who get deemed “superior” due to their culture. And I should be clear I am mad at Amy Chua herself. Yes, AT her. Not at her husband. Because as a woman of color, I think she should know better. Implication: Racism is over for you! Implication: You are just so much better than those other people of color, who won’t stop whining about their oppression. Let’s unite against other brown people, even though you’re never getting that promotion. It’s true. When 18millionrising began and hosted a Twitter conversation using the hashtag @NotYourAsianSidekick, it opened the door for other Twitter users to begin posting using the hashtag #AsianPrivilege. Some of the Asian American participants didn’t help, and responded by lashing out against other communities. While we people of color are in a corner busily accusing each other of having privilege, or being blatantly bigoted, or trying to explain how the data obscure the realities of racism and discrimination, the system of racism that privileges white people is having a party in the middle of the room. This, my friends, is not the Olympics. The only winner is the system. What the black-white binary does is limit the conversation, narrows our analytical lens, and leads to an incomplete organizing strategy. The Model Minority Myth plays into this binary by marginalizing the fastest-growing racial group from the discussion, and isolates distinct communities of people of color from one another. That’s right: Asian Pacific Americans aren’t black. 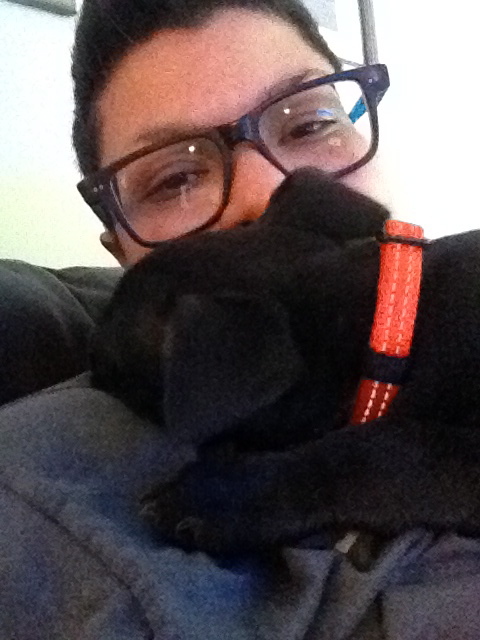 (I have been accused of not being black. It’s true. I’m not.) And by not being black, we are divided from our African-descent brothers and sisters. The binary and the Myth mean the organizing power of people of color is divided, and we end up primarily relating with white people instead of with one another. I feel exhausted, because now I have the sense that I need to go through an actual data breakdown to prove that Asian Americans should be in this conversation, along with Latin@s and Native Americans. I would like to walk away from this conversation, but I won’t. If I walk away, the system wins again. So instead of playing into the black-white binary, let’s try something else. Let’s try learning one another’s stories. Instead of comparing our puny pieces of the American story, or the amount of visibility or power or economic influence we have, let’s take a step back to look at the whole picture. Let’s try to determine how we add our collective power and stories together to fight a dehumanizing and bloodthirsty system. Let’s figure out what Native American sovereignty has in common with immigration and criminal justice reform. * In the 1960s, the narrative emerged that certain immigrant and other minority groups, primarily Asian Americans, were doing great, over and against other distinct communities of people of color. Michael Russell is the pastor of the Jubilee Faith Community of the ELCA (Evangelical Lutheran Church in America) in Country Club Hills, IL. Prior to that he did community organizing with Neighborhood Housing Services, Inc in Chicago’s West Englewood community. He is also an antiracism trainer and organizer with Crossroads Antiracism Organzing and Training. Michael is also vice president of SOUL, a grassroots coalition of faith based organizations focused on economic justice, leadership training and political responsibility in Chicago’s Southland. As Black history month approaches its final week, I continued to be reminded of the grip racism and white supremacy have on this nation. From the failure of a Florida jury to find Michael Dunn guilty of his unjustifiable murder of Jordan Davis to Ted Nugent’s racist rant about the President of the United States, the evidence that we are not in a post racial or colorblind nation is undeniable. Just a month ago the nation was commemorating the birth and legacy of Dr. Martin Luther King, Jr. in parades, interfaith services, community actions, and days of service but as I reflect upon the daily carnage of people of color lives lost and dehumanized in defense of white supremacy, I want to breathe new life and energy into Dr. King’s message and work for radical social transformation. King believed racism and economic oppression were cancers invading and destroying the soul of the United States. He worked to spread a message and organized to share a non-violent methodology because he believed that people working together for a common purpose had the power to excise these malignancies from our society and because he wanted to agitate for geo-political and socio-economic change. As a Baptist minister King preached against social messages, which sought to dehumanize African-Americans. Theologically and ethically, King held onto the conviction that God did not tolerate the sin of racism and stood on the side of those who struggle to bring dignity to all life. He appealed to the moral center of individuals and society because wanted them to understand that “[t]he racial issue that we confront in America is not a sectional but a national problem. Injustice anywhere is a threat to justice everywhere. Therefore, no American can afford to be apathetic about the problem of racial justice. It is a problem that meets every man [sic] at his front door.” King gave his life to organize a movement aimed at securing human and civil rights for People of Color in the United States because he knew that at stake was the very soul of this nation. King’s formula for change is strikingly simple: Message + Methodology + Momentum (movement) = sociopolitical change. One example of the application of this formula was the Montgomery bus boycott. The leaders of the civil rights movement were clear that racism was dehumanizing and denying basic human and civil rights to a part of this nation’s citizenry. They understood that racism had also socialized the African-American citizens of Montgomery to cooperate with and finance their own dehumanization through oppression, intimidation, and terrorism. Recognizing that liberation of African-Americans in Montgomery, AL would require divestment from the infrastructure of the city, a bus boycott was planned. Preparations were made to provide alternative modes of transportation. Meetings were held to prepare the community for the pressure they would experience. Then Rosa Parks, a 42-year old African-American woman trained in non-violent organizing at the Highlander Folk School, boarded a bus paid full fare for her ticket and refused to relinquish her seat defying the bus company’s rule that required a black person give up their seat to any white person upon request and move to the ‘blacks only’ section at the back of the bus. For this act of civil disobedience, Parks was arrested; an event that catalyzed the community’s support for the boycott. For more than a year, they inspired one another to resist and persevere through even the most violent tactics employed by local police, vigilantes, and the Montgomery business community. The resisters remained committed to their message, and methodology boycotting the buses and businesses that participated in discriminatory practices. They imposed grass-roots community based economic sanctions on their institutional oppressors. These sanctions weakened the economic foundation that sustained that particular racist system and raised the consciousness of a nation to the need for the elimination of Jim Crow practices. Right now we endure the continued exploitation of people of color who are used as human fuel for corporate economic engines, including United States militarization, criminalization and incarceration. Our nation along with the global community is being torn asunder by economic policies that increase the gap between the “haves and have-nots,” governmental and social disregard for the human rights of its most vulnerable citizens, a growing environmental degradation crisis, hegemonic wars, and the devaluation of all life, Dr. King’s words ring prophetic and his wisdom timely. As we organize to dismantle all forms of systemic and institutional oppression, our call is to struggle against the commercialization and dilution of the movement Dr. King helped birth. We must accept his challenge, rally the resistance, modernize the methodology, and live into his legacy by organizing and working together until the dream is made real for us all. Racism is alive and well in 2014. Systems of oppression continue to morph into new constructs that marginalize and dehumanize us all. Giving up is not an option. Let us honor those whose lives and dreams have been cut short by racism by renewing our commitment to work across all lines of difference for a world and nation in which all people thrive. As we conclude this years observance of Black history month let us not forget to that a true celebration and commemoration of Dr. King and the men and women with whom he labored in the civil rights movement demands that we work without ceasing to ensure human rights and civil rights are afforded to all. 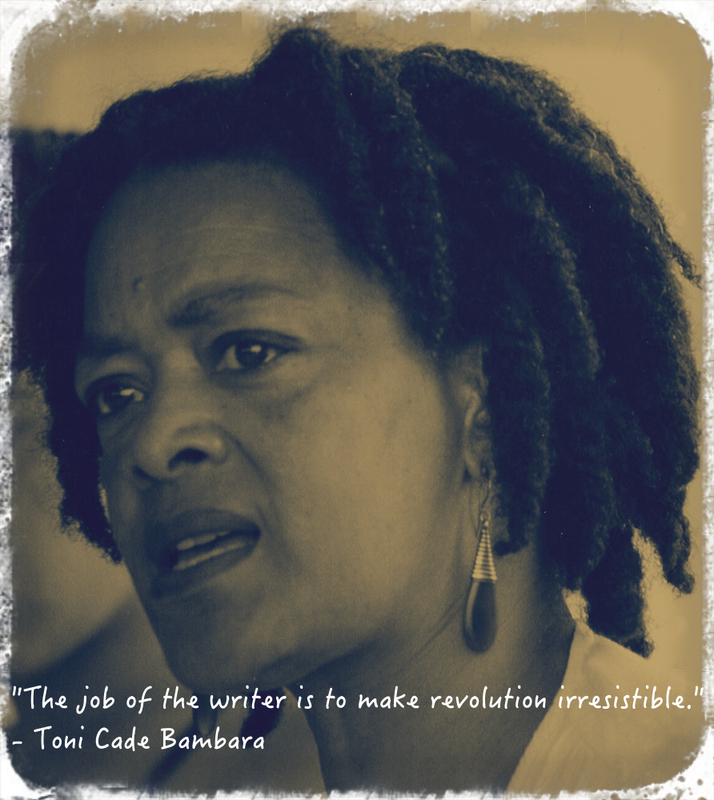 Toni Cade Bambara was a writer, activist, feminist, and filmmaker who gifted the struggle for civil and human rights with incisive words, powerful images, and opportunities for laughter. Among her many contributions to the world of arts and literature is an anthology of non-fiction, fiction, and poetry, entitled The Black Woman which was the first major feminist anthology featuring work by Nikki Giovanni, Audre Lorde, Alice Walker, Paule Marshall, and others. One of Toni Cade Bambara’s most beloved stories, The Golden Bandit, was published the year of her death in an edited volume titled Jump Up and Say! A Collection of Black Storytelling and it is a retelling of the children’s story Goldilocks and the Three Bears. Bambara’s ability to use this classic children’s story to offer a critique of White privilege and White supremacy is fun and a reminder of her gifts, which were lost too soon when she succumb to cancer in 1995. This past summer Debra Russell, Crossroads’ Director of Management and Resources, lead the participants of Crossroads annual gathering in an interactive reading of Bambara’s sharp retelling of the children’s classic. As Crossroads continues to remember voices often forgotten in the celebration of Black History month, we share this reading of Bambara’s Golden Bandit. Even though the notion that the US is “post-racial” has been pretty thoroughly trounced, we still hear people claim to be colorblind and that they treat everyone the same. 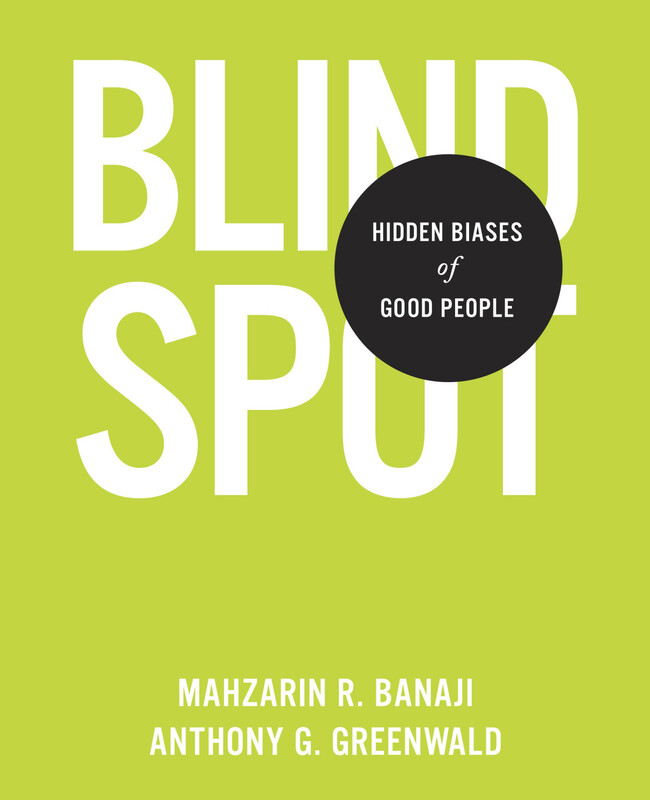 The purpose of Blindspot: Hidden Biases of Good People is to expose the large set of biases all of us have hidden in our brains and to show how those “bits of knowledge about groups of people” (their skin color, age, education or religion) can influence behavior. Karen Ziech organizes and trains in the Episcopal Diocese of Chicago where she has been a member of the Anti-racism Commission since 2008. As a member of Chicago Regional Organizing for Antiracism (C-ROAR) she is working to build a network of antiracist allies in the Chicago area. 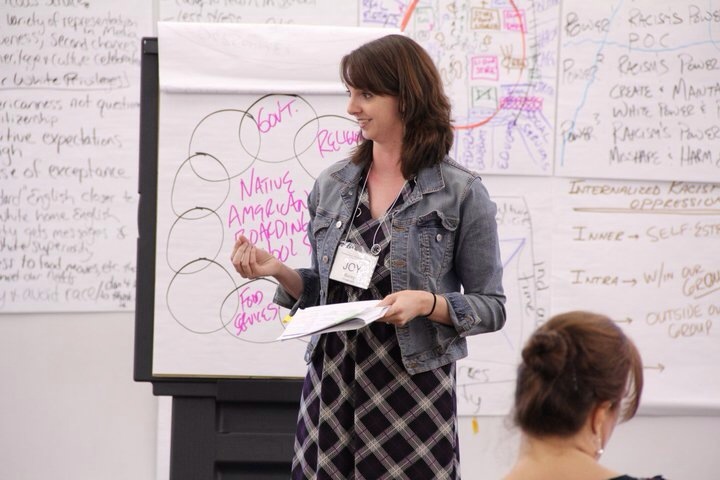 She moved into instructional design and training in the telecom industry where she worked for nearly fifteen years. As a career consultant in the outplacement industry. 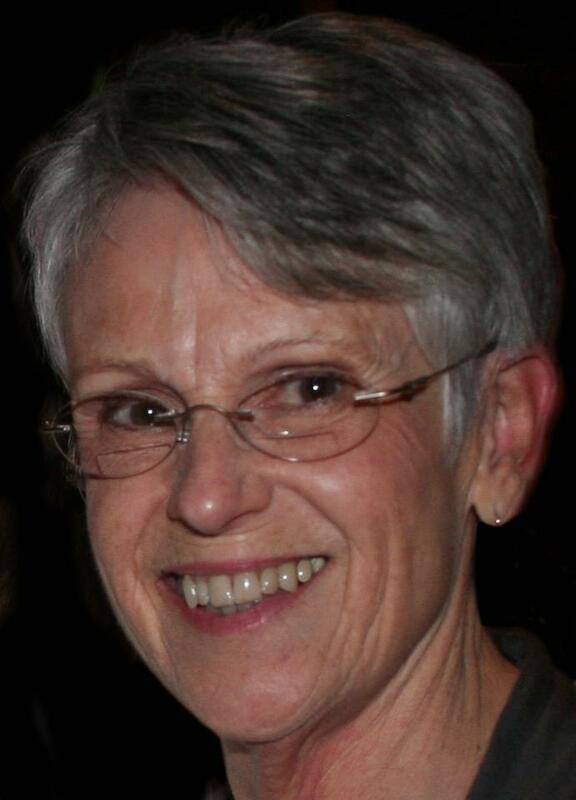 Karen loves spending time with her four children and their kids (eleven grandchildren and counting), practicing yoga, reading and walking. You may have heard of the Harvard Implicit Association Tests (IATs). Available online for almost 20 years, they were created by Blindspot’s authors to prove that it is “unconscious cognition,” rather than conscious thought that drives human judgment and behavior. The 10 minute exercises test the taker’s attitudes, one’s positive and negative associations, about groups of people. The data from over 14 million IATs show the disconnect between what “good people” believe about themselves and the reality of their implicit attitudes. Among the many attitudes studied, results reveal that in this country the preference for White people is pervasive, that we favor young over old (this is one of the strongest biases in our culture), and that we prefer straight people over gay people. Blindspot, like Crossroads’ Critical Cultural Competency workshop, shows how constant input from our culture shapes our attitudes and gives examples of how, when we’re unaware of them, we can engage in behavior that is damaging to others. The authors point to studies in which people with higher levels of preference for Whites judged White job applicants to be better qualified than Black applicants and where ER physicians recommended optimal treatment more often to White patients than to Blacks. While both these studies refer to the preference for White people over Black, the authors cite numerous examples of unequal treatment to Hispanics, Asians, Muslims and American Indians. While it can be discouraging to be confronted with our own hidden biases and to understand how unconsciously we behave towards others, the good news is that just being aware of the problem is the beginning of fixing it. The authors devote an entire chapter to ways in which we can spot behaviors that result in damage to people in stereotyped groups and what we can do to outsmart our implicit associations. It’s impossible to be truly color blind, but this book can help us to be intentional about treating everyone with the dignity and respect we all want. Blindspot is a thorough and compelling argument for getting in touch with one’s individual biases. It’s pretty clear, though, that the authors view this connection as just a first step. In the body of the book, they cover a short history of the study of racism in the US. And, in addition to the race IAT, which first established the widespread preference for White people over People of Color, the authors discuss the consistent implicit associations with Americans as White People, topics that would logically lead to a discussion of racism. It’s in the 40 page appendix that the book shows its true goal—to open up that discussion. 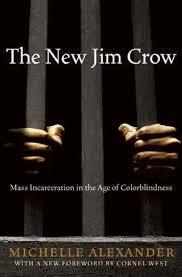 Here the authors cover the history of racism in the 20th century and its current levels in the US; causes and examples of racial and ethnic disadvantage (in criminal justice, education, health care and housing, to name just a few); and continued racial segregation. Because they are social scientists, they come at racism from the perspective of scientific studies. One hopes, one yearns, for a next book, which could cover studies about research that shows positive outcomes in dismantling racism. A native of Puerto Rico, Jessica identifies as a “1.5 generation Queer ESL Latina of Puerto Rican descent.” She works as a consultant and core/organizer trainer for Crossroads. Jessica holds a BA in Criminal Justice and Currently, Jessica holds Masters degrees in Theological Studies and Divinity. The terrorist attacks on the Twin Towers in New York City misshaped life in the United States in profound ways. The suspicion, vicious antipathy, and the violence that met Muslims and Arab-Americans after September 11th, 2001 was not surprising given the history of this nation. One of the developments of our post-9/11 world has been the racialization of those perceived to be Arab Americans and Muslims into the catchall racial category of “Arab/Middle Eastern/Muslim.” Sociologist and professor of Social Welfare and Justice Louis A. Cainkar suggests the 9/11 crisis did not create animosity toward the “Arab/Middle Eastern/Muslim/Other” community as much as it made evident preexistent anti-Arab/Muslim sentiments. While all who are lumped into the “Arab/Middle Eastern/Muslim/Other” category are not Muslim, Middle-Eastern or Arab, the dominant political discourse via the media has created a visualscape in the United States, which “otherizes” all who “appear” to be “Arab/Middle Eastern/Muslim” into this group. Consider for example the case of Sikh Americans, who are not Muslim or Arab but are routinely profiled as both and are often victims of hate motivated crimes. The hypervisibility this racialization bestowed upon previously invisibilized communities elicited a diversity of responses among which is “Arab/Middle Eastern/Muslim” stand-up comedy. Stand-up comedy in the intervening years since 9/11 has created a space where the racialization of “Arab/Middle Eastern/Muslim/Other” is being contested, explored, and where counter-narratives to dominant culture are being constructed. Acts like the Axis of Evil Comedy Tour, The Muslims are Coming, and Allah Made Me Funny along with comedians like Ahmed Ahmed, Mohammed Amer, Maz Jobrani, Preacher Moss, Dean Obeidallah, Negin Farsad, and Azhar Usman are just some of the stand out acts that have come to define “Arab/Middle Eastern/Muslim/Other” stand-up comedy in the last 14-years. 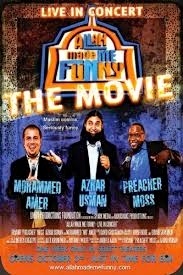 This week I watched and laughed with the stand-up comedians behind “Allah Made Me Funny.” This documentary/comedy concert centers on three stand-up comedians: Palestinian-American Mohammed Amer, Indian-American Azhar Usman, and African-American Muslim convert Preacher Moss. Each of the comics is presented as being firmly grounded in their faith. Additionally, the observance and practice of Islam features prominently in their acts, which appear directed to a mostly Muslim audience. Each comic takes the stage for 20 minutes in which they share their humorous observations about Muslim women, air travel, stereotyping, racial profiling, generational communication issues, cultural idiosyncrasies and the challenges of being Muslim in a country that is ignorant of Islam and those who practice it. In the end where Allah Made Me Funny succeeds as a stand-up comedy show is in redefining what it means to be a Muslim in the United States after 9/11. Louise A. Cainkar, “The Social Construction of the Arab (and Muslim) American,” in Homeland Insecurity: The Arab American and Muslim American Experience After 9/11, First (New York, NY: Russell Sage Foundation Publications, 2011). Andrea Kalin, Allah Made Me Funny – Live in Concert (Unity Productions Foundation, 2009). Hussein Rashid, “Allah Made Me Funny : Borscht Belt Goes Halal,” ReligionDispatches, October 9, 2008, http://religiondispatches.org/archive/culture/600/allah_made_me_funny__borscht_belt_goes_halal___culture___/. Jennifer Ludden, “Allah Made Me Funny: Muslim Comedy : NPR,” NPR.org, August 14, 2005, http://www.npr.org/templates/story/story.php?storyId=4799868. “A social movement that only moves people is merely a revolt. A movement that changes both people and institutions is a revolution.” – Dr. Martin Luther King, Jr.
As we enter the month of February, Black History Month, which follows on the heels of MLK DAY, I have been reflecting on the accomplishments of Dr. King and others in the Civil Rights Movement. This year we will celebrate the 50th anniversary of the 1964 Civil Rights Act, yet I am mindful of how far we still have to go towards racial justice. Racism continues to permeate every facet of our society. It impacts individual People of Color struggling against racial micro-aggressions and individual White people who continue to reap the benefits of White privilege and White supremacy. Racism also manifests in our society’s culture at large, imposing dominant White cultural ways of being on everyone and distorting, discrediting and destroying People of Color cultures while simultaneously appropriating them. Finally, racism continues to get lived out in the policies, practices and structures of our institutions as evidenced by outcomes like the Achievement Gap in education (more aptly called the Opportunity Gap) and health disparities. 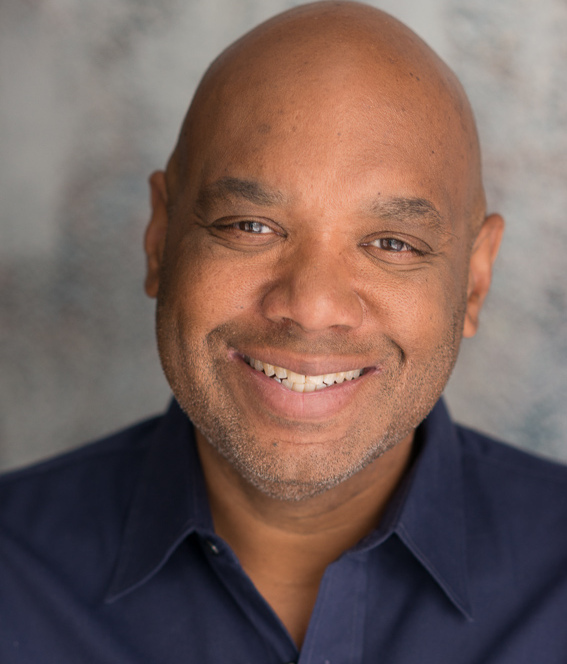 Crossroads organizer and trainer James Addington likens the ever-present and simultaneous manifestations of individual, cultural and institutional racism to an electromagnetic force field that is very difficult to penetrate. He shares a story of a friend of his who found herself in a meeting where she was the only Person of Color and the only woman. She, for the life of her, could not make herself heard. No matter how hard she tried to bring her voice to the table, she was continually ignored and dismissed, or someone else got credit for her ideas. She described the experience as similar to being surrounded by a force field from which she couldn’t break free. The metaphor of racism as an electromagnetic force field is powerful because once the problem is identified then we can begin working toward a solution. Racism is a structural problem that requires a structural solution. There needs to be an injection or intervention into the force field of racism that will weaken its power over us; that will heal us and restore community. Since there are at least three ways racism manifests itself, individually, culturally and institutionally, there are at least three ways to apply an intervention. 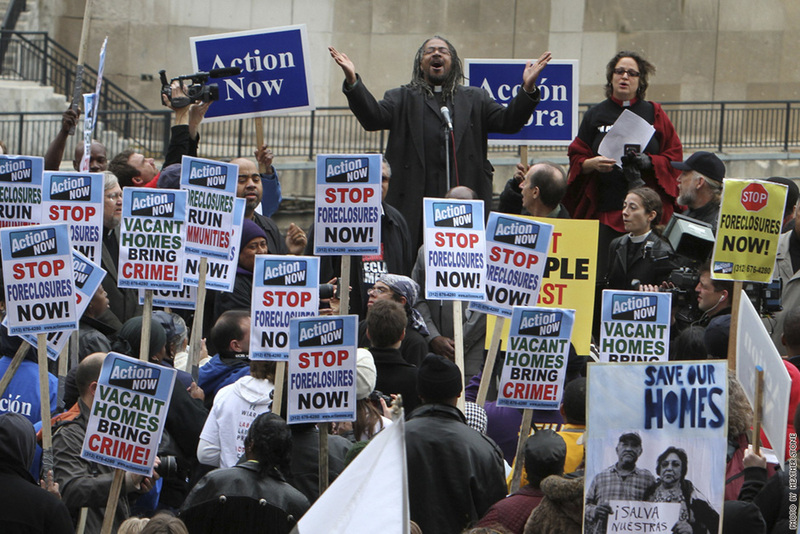 Some racial justice activists and organizations utilize individual interventions. Generative Somatics is an organization that makes a distinction between oppression and suffering, that the former is externally created and the latter is internal. They argue that many organizers for social justice tend to focus on systemic oppression and neglect self-care. They argue that committing to practices that acknowledge and interrupt “conditioned tendencies” developed in response to stress and trauma, can open us up to more healthy and appropriate ways to respond to individual suffering and more effectively struggle to end racial and other oppressions. Other organizations challenge cultural racism in our society. For example, Race Forward does a tremendous job of shifting worldviews and language around race and racism in the media. Their Drop The I-Word campaign is just one example of the many ways Race Forward strives to generate a cultural shift in the way our society thinks and talks about race and racism. Oyate is a Native organization that sells books and provides trainings and reviews in order to ensure that Native lives and histories are portrayed with honesty and integrity. 18 Million Rising is another organization that challenges cultural racism by exposing and debunking cultural stereotypes through focused campaigns like #NotYourAsianSidekick. 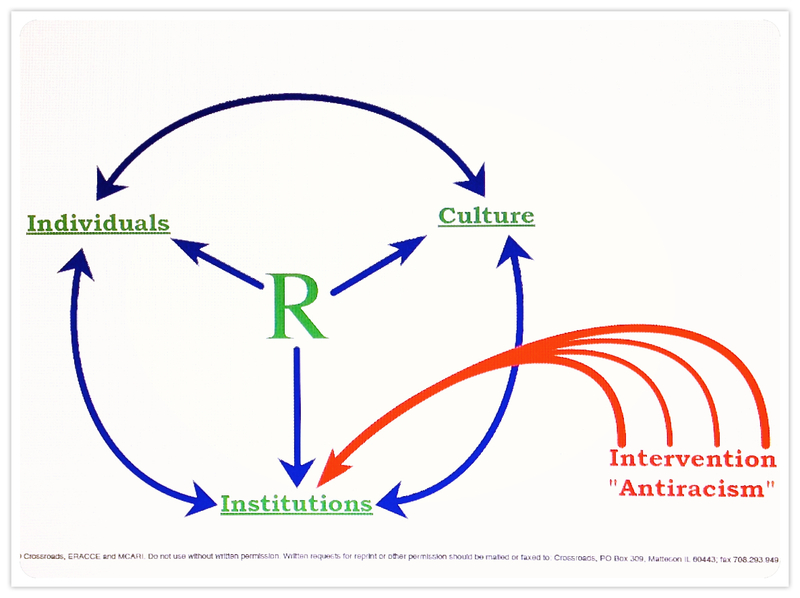 Crossroads applies our intervention into the force field of racism at the institutional level. We don’t think that an institutional approach is the only or even the best way to eliminate racism, but it is a necessary component to racial justice. It is what we, as Crossroads, offer to the movement. Of course we also address individual and cultural racism, but we do so in the context of institutions and systemic racism. Part of the reason we choose to focus on an institutional intervention is because institutions are where individuals and culture come together. Institutions are made up of people who make decisions and enforce policies and procedures and our society’s cultural values and practices get lived out in our institutions. Our institutions also create, manage and distribute the resources necessary for life. As Robette Dias, Crossroads’ Executive Director, likes to put it, we have replaced the life sustaining nature of the land with institutions. 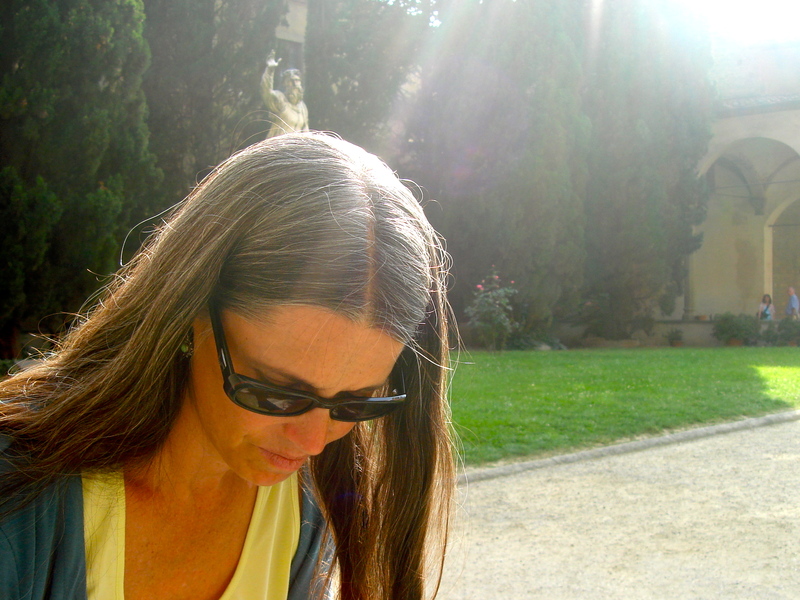 Today, people in the U.S. gain access to the stuff of life through accessing institutions. The problem is that our institutions don’t create, manage and distribute resources equitably to all people and all living beings. The injection Crossroads offers to diffuse the force field of racism is an antiracism intervention. Our method of intervening and disrupting uses a variety of organizing strategies, workshops and organizational development tools to transform institutions into antiracist multicultural institutions that are life giving for all. To learn more about Crossroads’ antiracism intervention in institutions go to www.crossroadsantiracism.org or call us at 708-503-0804.